"Bot Libre makes mobile, social chatbot Building easy and for free!!" bot Libre makes someone an expert that wants a quick and inexpensive way to build a simple bot, even for use on their company's website, this is a really compelling platform with lots of handy features. The UI and interface does not look that modern and the new features are not that updated compared to other platforms , though this is free so I cant relly say anything bad but it has need to update its users interface. Back then when chatbots were a fascinating trend Ive used this and the Ui is still the same. I use this to build the chatbot for different social media platforms, it's easy to use in different platforms. Ive seen this new features..
"Easiest and the most sophisticated chat-bot"
the text to animation is not open-source yet and it is lacking many actions for chat-bots available. The platinum subscription support, however, provides customization of bots. Botlibre is a great platform for UX/UI on your website and can also be custom hosted. It is easy to develop yourself and has good support. It is Canadian and a very robust product, I even used it in mental health research and the bot is dead stable. 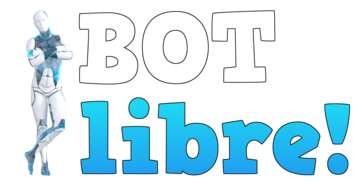 I use BotLibre for an automated CDSS, system, as voki like avatars for e-learning and as social bots. * We monitor all Bot Libre reviews to prevent fraudulent reviews and keep review quality high. We do not post reviews by company employees or direct competitors. Validated reviews require the user to submit a screenshot of the product containing their user ID, in order to verify a user is an actual user of the product. Hi there! Are you looking to implement a solution like Bot Libre?